According to UNESCO’s latest report on Cracking the Code: Girls‘ and women’s education in STEM only 17 women have won a Nobel Prize in science fields since Marie Curie in 1903, compared to 572 men, and only 28% of all of the world’s researchers are women. 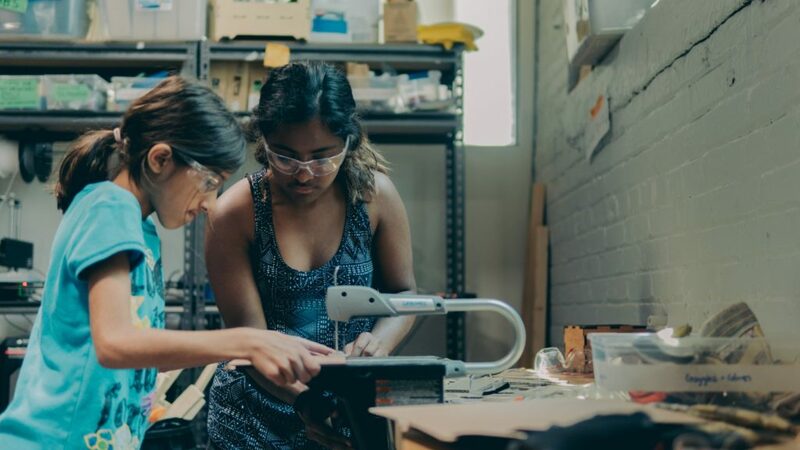 At STEAMLabs, we believe stats like these are partly because girls and women don’t feel welcome, comfortable or empowered in spaces that are historically male dominated – like science labs, engineering firms, space stations and maker spaces. 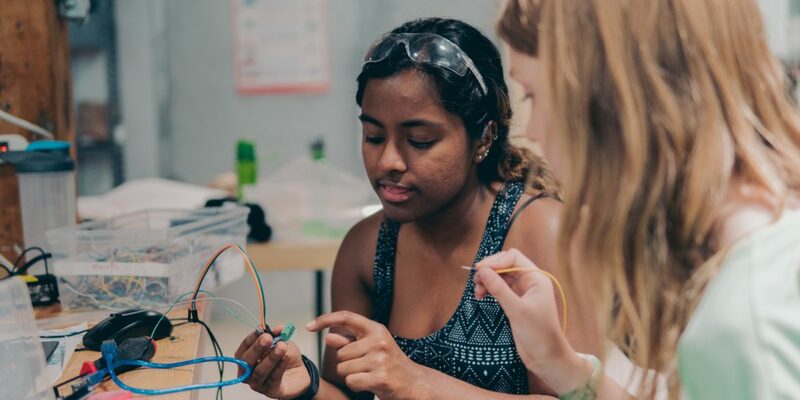 Inspired to support more girls thrive in tech spaces, Meera Balendran the Director of Youth Programming and colleague Kat Barrett mentored the first batch of girls through a new program they designed specifically for girls at STEAMLabs. 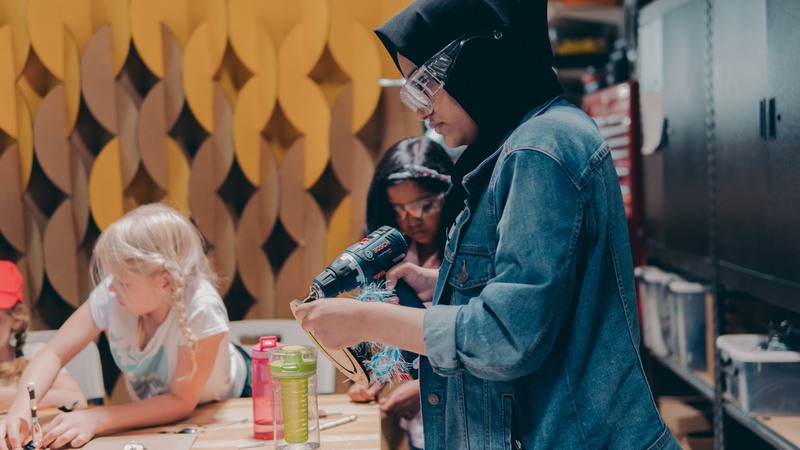 Girls used electronics, robotics, woodworking and crafts to re-imagine and prototype ideas for some of Toronto’s most diverse urban spaces. Girls in the program took field trips to observe spaces and architecture in the city, have conversations about how people and cities interact, imagine ideas for what could be, and prototype them. Projects from the summer cohort included everything from model ferris wheels to community bike racks. “It’s important that all kinds of people get to take part in the re-shaping and re-designing of technology and physical spaces, and the Robotic Playgrounds program is our attempt to make space for girls to do that”, says Meera. Kat explains that “designing and building is an endless cycle and girls and boys tend to start at different stages of that cycle. 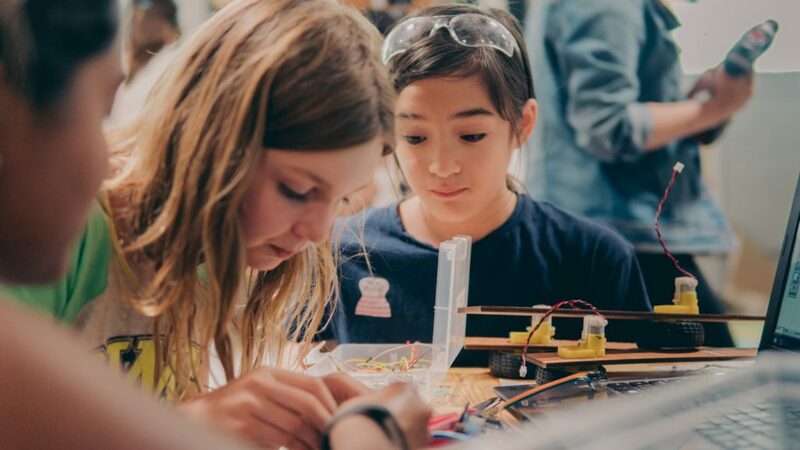 We notice that while boys tend to flourish when you let them launch in and get hacking away, girls tend to spend more time on their plan before they start prototyping. Read more about Robotic Playgrounds Made by Girls and sign up for the Fall program starting this November. If you would like to read the full UNESCO report Cracking the Code: Girls‘ and women’s education in science, technology, engineering, and mathematics, click here.